Even though Benedict Cumberbatch is primarily known for his work as an actor and stealing his fans' hearts, it cannot be denied that the British star is also well known for being part of memorable and enjoyable red carpet moments. Whether it's through an epic photobomb of what was supposed to be a picture of U2 at the Oscars in 2014 or through taking part in a sweet tribute among other celebs to honor CNN Heroes, it's pretty much guaranteed that whenever Benedict Cumberbatch hits the red carpet, there will never be a dull moment. And what a wonderful thing that is! The red carpet can sometimes be so stiff, with celebrities posing for several minutes for the perfect shot and sometimes answering interview questions with nothing more than a sentence or two. It's refreshing to see someone like Cumberbatch think outside the box with how he presents himself on the red carpet even when it's on a whim. Seeing as the Golden Globes are coming up on Sunday, Jan. 11, and Cumberbatch is nominated for Best Actor in a Motion Picture, Drama, some fans are probably wondering if he'll have another fun or touching moment in store for them when he takes on the red carpet. Since many of these moments are spontaneous, those fans will probably have to wait until the big day to see if he does anything spectacular before the awards show. 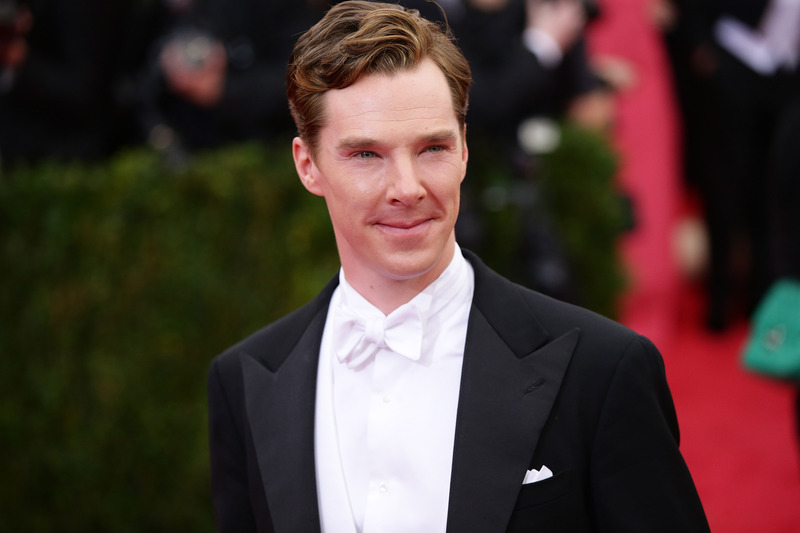 But in the meantime, have a glance back at some of the actor's best red carpet moments Cumberbatch has had so far. And here's hoping to seeing some more soon! You can't have a collection of Cumberbatch's best red carpet moments without including this one. You just can't. Everything about this photo, from the stiff poses and the oblivious nature of the subjects, to Cumberbatch's facial expression, to the this is the Oscars setting is pure gold. Cumberbatch is proof that even celebrities aren't immune to fanboy freak-outs. Here, on The Imitation Game red carpet, he spots the crew from Star Trek and doesn't even try to contain his squeal. But naturally, he bounces right back to the interviewer's question. What a pro! This isn't really so much of a specific moment as it is a sweet gesture from Cumberbatch to be part of a group of celebs honoring CNN heroes, who are ordinary people doing amazing things to try to change the world. Aww! This interview was a perfect combination of sweet and sassy. Though he cracked jokes at the beginning, he quickly sobered up when speaking about great men he looked up to, including the late, great Robin Williams. Good for him for giving credit where credit is due. You knew it was coming. In November, Cumberbatch made his much talked about red carpet debut with his fiancé Sophie Hunter. While he no doubt broke hearts, they both looked undeniably stunning. To be asked to play such a phenomenal human being — a true English hero — is a great honor and comes with a great responsibility. See you at the Golden Globes!